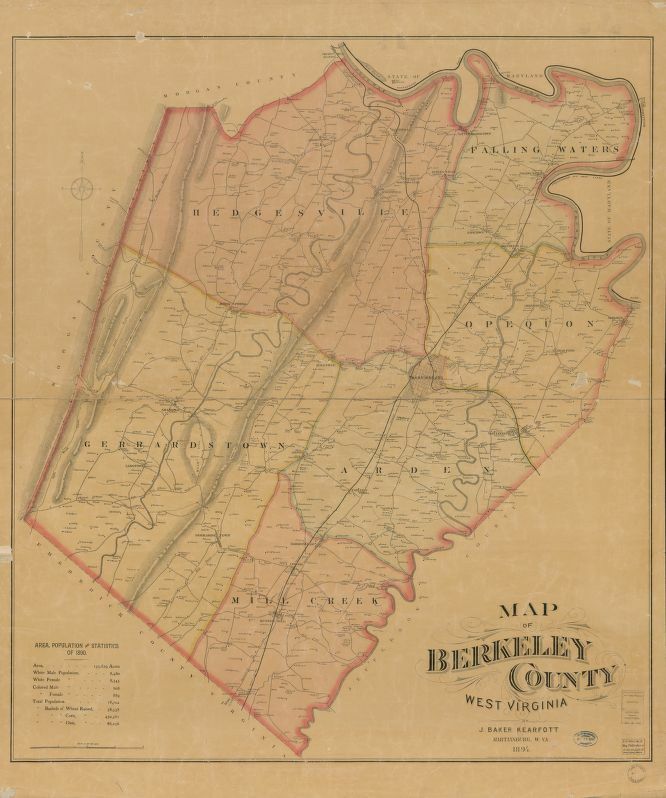 According to missionary reports, several thousand Hurons occupied present-day West Virginia, including the Eastern Panhandle region where Berkeley County is located, during the late 16th and early 17th centuries. During the 17th century, the Iroquois Confederacy (then consisting of the Mohawk, Onondaga, Cayuga, Oneida, and Seneca tribes) drove the Hurons from the state. The Iroquois Confederacy was headquartered in New York and was not interested in occupying present-day West Virginia. Instead, they used it as a hunting ground during the spring and summer months. During the early 18th century, West Virginia’s Eastern Panhandle region was inhabited by the Tuscarora. They eventually migrated northward into New York and, in 1712, became the sixth nation to be formally admitted into the Iroquois Confederacy. The Eastern Panhandle region was also used as a hunting ground by several other Indian tribes, including the Shawnee (then known as the Shawanese) who resided near present-day Winchester, Virginia and Moorefield, West Virginia until 1754 when they migrated into Ohio. The Mingo, who resided in the Tygart Valley and along the Ohio River in present-day West Virginia’s Northern Panhandle region, and the Delaware, who lived in present-day eastern Pennsylvania, New Jersey and Delaware, but had several autonomous settlements as far south as present-day Braxton County, also used the area as a hunting ground. During the American Revolutionary War (1775–1783), the Mingo and Shawnee, headquartered at Chillicothe, allied themselves with the British. In 1777, a party of 350 Wyandots, Shawnees and Mingos, armed by the British, attacked Fort Henry, near present-day Wheeling. Nearly half of the soldiers manning the fort were killed in the three-day assault. The Indians then left the area celebrating their victory. For the remainder of the war, smaller raiding parties of Mingo, Shawnee, and other Indian tribes terrorized settlers throughout northern and eastern West Virginia. As a result, European settlement throughout present-day West Virginia, including the Eastern Panhandle, came to a virtual standstill until the war’s conclusion. In 1670, John Lederer, a German physician and explorer employed by Sir William Berkeley, colonial governor of Virginia, became the first European to set foot in present-day Berkeley County. John Howard and his son also passed through present-day Berkeley County a few years later, and “discovered” the valley of the South Branch Potomac River at Green Spring. From Wikipedia about Berkeley County, West Virginia. This entry was posted in Cayuga, Delaware, Huron, Iroquois, Mingoes, Mohawk, Oneida, Onondaga, Ottawa, Seneca, Shawnee, Tuscarora, Wyandot. Bookmark the permalink. Date the map was created? Could not be sure when I enlarged it. Being born in Keyser, WVA, my dad informed me that we were of Seneca extraction. My great-grandmother, (Maude Day) was supposed to be Seneca. She was 93 at her death in 1952. She indicated that she was 1/2 Seneca which would mean I would be 1/16th! My late father Frank Nethken would have been 1/8th. My reason for this inquiry is to finally resolve my Indian heritage once and for all. I want to find the source, if there is any. This is my only reason. I live in Payson, AZ and have for many years and I have conferred with the Tonto-Apache tribe here as well as the White Mountain Apache tribe on my finding the source to my question on my Native American ancestory. Could you find me a source. Greatly appreciate your help! Am very interested in this topic. Have an Indian Burial Mound in my community, Hedgesville, WV outside martinsburg between martinsburg and berkeley springs by way of main road route 9.. Have a video posted on my instagram @retrochalet if you can see it. Has a plaque. Interested in the tribe and year it may have been from. The original developer of the properties preserved the mound in the late 70s yet it was disturbed by “a coal road in 1940” which makes me sad. It is now taken care of by our HOA and I’m happy about that. However the original information I found said that it was Tuscarora. What I do not understand is why the road nearby is named Chief Cornstalk, and I found that answer in your article. What I do not understand is he was Shawnee nation Leader how do the Tuscarora have ties to Iroquois? I figured they would be completely different. Anyhow my name is Cindy Fahnestock Schafer and you can find me by cutting and pasting my name. Thank you.